As a longtime user and lover of MAC, I’m quite surprised I haven’t shared with you my three holy grail products for my face. These products I have used nearly every day for the past year+ and I don’t foresee myself switching up this regime anytime soon. No point in fixing what ain’t broke, ya know? The majority of my teen life up until the last year and some change I really had awful skin. I had acne all over my face that no matter what I did would leave me with some pretty intense scarring. This past year with the help of a dermatologist, some topical treatments, and the use of only one high-end high quality brand on my face, my skin has never been better. Obviously medication and a regimented skincare routine mostly contributed to this significant improvement, but I’d like to think the MAC products I was putting on my face everyday to coverup made my skin better. In the least they certainly didn’t make the situation any worse like sooooooooo many brands I’ve tried before had. Right along my journey to better skin MAC provided me with the only accurate color match, high coverage finish I desperately needed, and really, confidence to manage the situation I was faced with everyday. Now I’m left with some significant scarring and redness; however with my face smoother than ever, you’d never know I was plagued with acne and scarring these last five years due to this amazing brand. People wonder why I love MAC so much and this is a huge reason why. They made an already unpleasant high school experience due to bullying based on appearance so much more bearable. I am pale. And when I say pale, I mean extremely pale. As in I break out into hives when being in the sun for extended periods of time without SPF due to UV rays (so thank goodness this product has SPF in it!). With all foundation lines I’ve tried, other than MAC’s, the lightest shade available is ALWAYS too dark for my skintone, and/or has intense orange or yellow undertones that don’t match my pinky-ness. I remember the day I was color-matched at the MAC counter. The most pleasant makeup artist noticed my naive self struggling to pick a shade. I was testing the mineralized formula bopping between NW15 and NW20, the lightest shades displayed for the pink-undertoned foundations. I explained to her I needed something high-coverage that was good for combination skin, and needed help being color-matched. So she dragged me over to the studio fix fluid, scurried behind the register, and bolted back with that formula in NW10 and NW13 in hand. She said this would be it; the perfect foundation and coloring. And to this day she was so right. NW10 is perfect for winter, and since I don’t really tan (/nor should I unless it’s fake) NW13 is ideal for summer, and I could mix as needed. This foundation is high coverage, long lasting, and the amount of product in a bottle can last a solid 2+ months. It is creamy and light; despite it being high coverage. Toward the end of the day it does start to get a bit oily and cakey looking in spots on my skin that are more regular-oily, but that isn’t anything blotting and a bit of powder can’t fix. It also lasts really well in the heat of the summer. This is by far my favorite foundation and since my skin is finicky, that won’t be changing anytime soon. Mustn't rock the boat. For the last few months; day-to-day, for sports, or swimming I actually managed to only need concealer and some powder to get a decent enough light-weight coverage. This one in NW15 is always the concealer I grabbed. Luckily a little goes a long way for this one, so you get your money’s worth. Again it’s a great color match, high coverage, and long lasting. It does have a slightly more yellow undertone for an NW; however that just helps in brightening the skin. When paired with foundation it covers and blends so well. Contrasting the foundation, this dries quickly and does not get cakey or creased. It’s amazing! All in all it’s a high quality concealer I’d recommend any day. One of the best I’ve tried. Overall this is a solid pressed powder; however it’s not as long lasting as they claim, nor oil resistant. It does fair well in the heat of the summer, though. Plus, it isn’t chalky looking when on. The only minor issue I have with this (though I still wear it religiously) is that it isn’t available in the widest range of colors. I would like to see a translucent one as a pressed, since I've found 'Light' to have slightly changed the tint of my makeup making it look a bit darker and more yellow than desired. At this point I really want to switch to using a translucent powder regularly to obtain that finished look. As of today I actually have converted to using a Tarte translucent loose powder. So far I love this Tarte one. Tarte is noncomedogenic, cruelty-free, vegan, and a bunch of other good stuff for the sensitive skinned and really anyone; so it seems promising. I’ll talk about that product shortly, but today is all about MAC! Are you a fan of MAC? What are some of your favorite products from them? These sound like they work really well. I actually don't use any MAC products anymore other than their lipstick. Maybe I should give these a try? I usually just stick to Urban Decay because they don't test on animals. I love everything from MAC they are amazing! 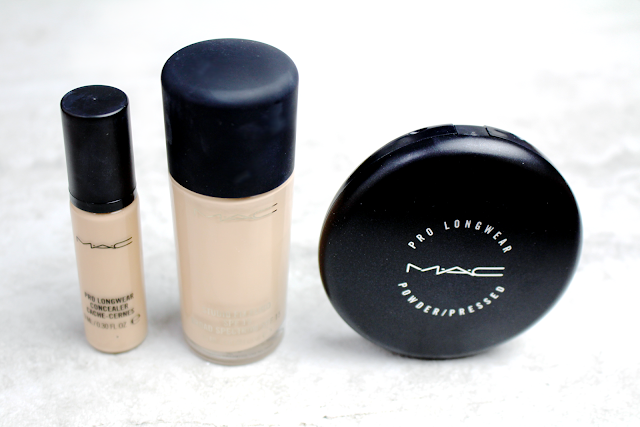 I love the MAC Prolongwear concealer, I'm still yet to find one that I can compare!